Outward signs of suffering are one thing, but mapping out how people endure grieving can be a difficult task to maneuver. That’s precisely what director Wai Ka-fai attempts with his latest film “Written By.” The film delves into the psyche of a person dealing with tragedy and becomes a fascinating exploration of how people cope with loss. The film revolves around a family who is involved in a deadly car accident. 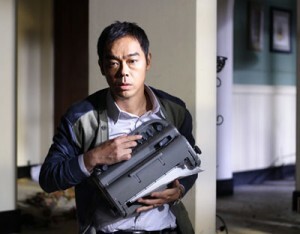 The lawyer father (Lau Ching-Wan) perishes in the crash and the daughter, Melody (Mia Yam), loses her eyesight. Ten years later, the family—particularly the mother (Kelly Lin)—still suffers from its loss. In an effort to help her mother move on, Melody decides to write an alternate-reality novel in which the father is the only surviving member of the crash. When the father’s fictional world is brought to life, it’s the first in a number of alternate realities that the movie portrays. The father gets around to writing a novel himself—which, in turns, also plays out on screen—and the line between real and unreal begins to waver, leaving the audience to wonder if characters are fictional or not, in the novel or in Melody’s head, or even real people or ghosts. Wai isn’t afraid to dip into the metaphysical, if previous works such as “Running on Karma” and “Too Many Ways to Be No.1” are any indication. Melody’s story frequently dips into the realm of the fantastic, with streetcars from the underworld and spectral representatives of death abound. That whimsy helps balance the otherwise harrowing trial that Melody goes through. The twists and turns may confound some or, worse, derail the narrative to people unwilling to dive into the fantastic (of which it does wholeheartedly). However, in attempting the difficult task of mapping out the visceral experience of personal loss, Wai comes up with a marvelously affecting film. “Written By” made its world premiere at the New York Asian Film Festival. It screens at the Festival on Mon., June 29, at 11 a.m. at the IFC Center. For tickets, go to the IFC Center Web site.